This weekend my boyfriend and I were selling our Sportbraais at the Lorensford market. You can check out the website: www.sportbraai.co.za where you can also purchase the braais. This market is held on the first weekend of each month. It's a nice market and well worth the visit. I heard that next month's market is to be bigger than usual and will be a bustling place because of the run for life event which is happening that same weekend. After the market finished at 2pm we went to the Lourensford wine tasting room and enjoyed a lovely wine tasting. The estate is lovely. As you drive through, you have a beautiful view of the vineyards with the mountains in the background. The wine tasting room is in a very nice building, with lovely water features outside, and the interior is really warm, welcoming and stylish. I saw that they also have a restaurant near the wine tasting room, which had lovely views and looked like a nice place to enjoy a weekend lunch. 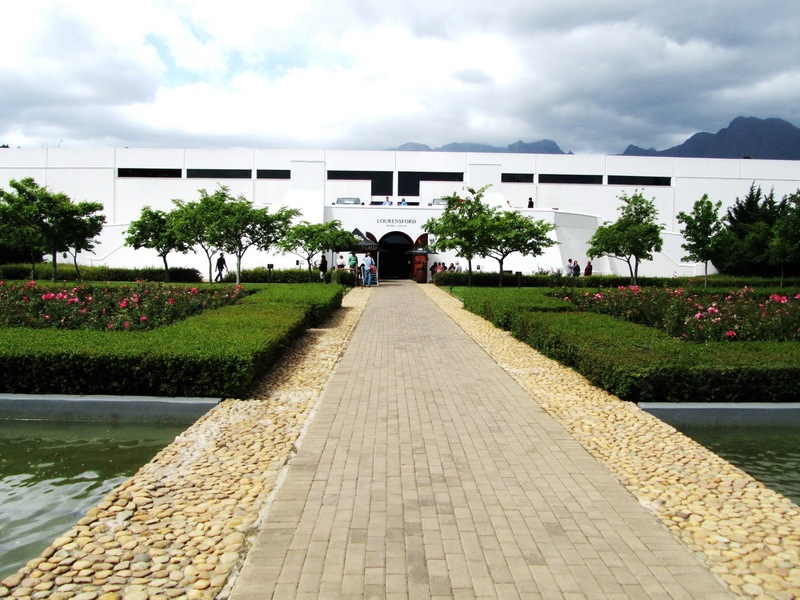 On the weekend we went, Lourensford was also selling some of their wine on special just outside the tasting room. I walked away with a case of the River Garden Rose 2010, it was really nice and easy drinking. They were selling it for only R20 a bottle, it was a steal!! They even had their recently released MCC for tasting. It was very fruity and refreshing. In the cellar, the service was great, the staff really knew their wine. You can try either the winemakers selection (4 to choose from) or the Lourensford Estate wine (7 to choose from). A tasting costs R25 at this winery, however, if you buy wine the fee is waived. The lady serving us was kind enough to let us try some from the winemakers selection and some from the Lourensford Estate section.I tried the Winemakers Selection Sauvignon Blanc 2010 (R90), the Viognier 2010 (R95), the Syrah 2009 (R150), the Lourensford Estate Shiraz/Mouvedre/Viognier 2010 (R95), and the Semillon Noble Late Harvest 2009 (R90). All of these were very nice, had lovely flavour and were very elegant wines. At the tasting room, they also sell delicious chocolate!! It is definitely a must to buy some of these chocolates to eat while drinking your wine or for trying after your wine tasting.They are truly devine!! After the wine tasting, we went to the coffee tasting room. That was something unique. You can sit down and have a cup of coffee for free!! This way you get to try the coffee for sale, yet you don't pay for the tasting. My coffee was so good that I ended up buying 250g of coffee beans, which they ground for me at the shop. They really know their stuff when it comes to the coffee and how finely the beans should be ground depending on what you are using to make your coffee. I totally recommend coming here when you do a wine tasting at Lorensford!! And, I highly recommend visiting this winery. Was a really nice experience! !